An early design by John Browning for pistols that lacked a breech locking mechanism, the 25 ACP is a small but mighty round. 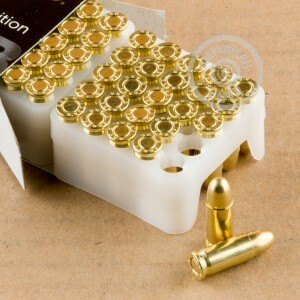 Great for use in self-defense or tracking your progress on the range, this full metal jacket ammunition is sure to please. 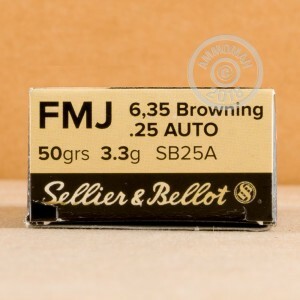 These rounds are manufactured to the highest specifications by Sellier and Bellot, so you can be sure that this full metal jacket ammunition will perform. Producing munitions since 1825, Sellier and Bellot manufacture rounds for hunters, competitions shooters, law enforcement agencies and militaries across the world. This product is brass cased, boxer-primed, non-corrosive and reloadable.